Zack Freeman is back ... and so is his crazy runaway bum. But this time they're not fighting each other–this time they've joined forces to save the Earth from the most serious threat it has ever faced: an invasion of zombie bums ... zombie bums from Uranus. Join Zack, his bum, Eleanor, Silas Sterne, the Kicker, the Smacker, the Pincher, the Forker, the Flicker and the Mutant Maggot Lord in the heart-stopping, nostril-blasting, Zombie-Bums-from-Uranus-filled sequel to The Day My Bum went Psycho. 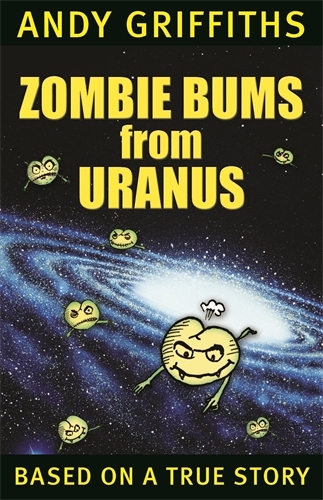 Zombie Bums From Uranus – another story that you and your bum will never forget. - The publication of Zombie Bums From Uranus is a significant event in the life of anyone aged 9 to 12 years old! It will be supported by a high-powered marketing campaign including television advertising and eye-catching posters and dump bins. Publicity will include an author tour to major cities and support from television and major newspapers.